It’s like a commitment for every Palestinian, and especially every Gazan, to make before leaving the borders of the Occupied Territories: a commitment to get insulted and humiliated and never say a word. Four hours of waiting to get permission passed like four years. The excitement I had didn’t make the situation any easier. I was sitting with my friends who have been approved for the leadership program in USA when a Palestinian who worked on the Beit Hanoun border told us to get ready to leave. No words could describe what I felt then. “Oh, thank you, God. Finally, we are passing!” I screamed. I simply went crazy and started to jump out of indescribable happiness, forgetting about everybody around. My steps were too big and I could hardly breathe. All I could think about was that I wanted to get there as fast as I could. 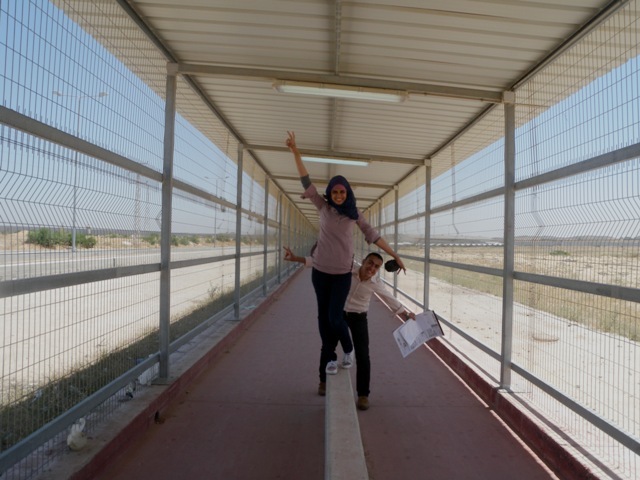 I didn’t know what was waiting for me after the long road that separates Gaza from Erez. As I passed through the first checkpoint, the alarm bell rang. I started to feel worried but one of my friends told me that it was because my bag contained a laptop. Seeing some Palestinian men working there helped me to relax. One of them told me not to worry as this was normal. He took it from me and he asked me to enter the gate again. I did, with my heart beating fast. After that we were led to enter lots of gates, one after another. My eyes waited excitedly to see the green lights. I reached one point where I had to stand in an exact way. I tried to show that I had no fear. I saw the green light and they allowed me to pass. I took a deep breath then, but I was so rushed! Unluckily, I heard some Hebrew through the speakers which were spread everywhere around. Then an old Palestinian man who was responsible to show the travelers where to go yelled loudly, calling me back. “I don’t know what the problem is with you, my daughter,” he said with his eyebrows high, showing surprise and worry. “Come back to the same gate and do as I tell you to do,” he continued. I couldn’t hide my panic anymore. I did as I was told but the signs of worry on my face were obvious. “Smile or else the photo will be dark,” the Palestinian man joked to make me less worried. I wondered why everybody else was having fewer obstacles at passing than I, but I had no answer to my question. I thought that nothing could be worse than that when I passed that grim gate. I was mistaken again. They sent me to a special check point. I was ordered to go into an empty room with a window of glass and an empty chair, a table, and a microphone behind it. I was about to cry, but I tried to pull myself together because I believed that what would make them happy was seeing me fall. I kept standing and just waited. It was totally quiet and I had no idea what was going to happen next. Suddenly, while I looked around the place randomly, an Israeli female soldier sat in the chair. “You have to do what I tell you exactly,” she said. “Take off your trousers,” she continued with that severe, intense voice. I looked at her with surprise, asking if she was serious. She repeated the same sentence in a louder tone. I could not summon any reaction but the same shocked look. “It is an order!” she shouted, and continued, “You don’t have to worry as only you and I are here.” I kept my head high and I took them off, insisting on making my dream of reaching Jerusalem reality. She ordered me to turn myself around and then pull my t-shirt up. I put my stuff inside a box to be checked as she ordered, and then got it back to dress again. I am writing this to you feeling so low. Maybe some would think that I should not speak about this, but I must. People have to know how we are humiliated, how badly we are treated, as if we were less than human beings. What was the point of doing that? Obviously nothing! Why did they choose me in particular? For absolutely no reason! They just wanted to enjoy inflicting psychological torment on somebody, and the lot fell upon me. I tried to keep my strength, but this experience left a deep pain inside me. All my friends passed earlier than me. They waited for me on the other side. As I joined them again, I felt so much better. I decided to live in the moment and not to let anyone ruin my happiness at finally reaching the bus of the American embassy that had been waiting for four hours to take us to Jerusalem. I only needed to deeply breathe the fresh air of the lands on the other side of the Erez border to feel relaxed. It was such a special feeling. We got into the bus which drove us to Jerusalem. I kept looking through the windows at the places around us. I was amazed. I saw fantastic nature wherever I directed my eyes. They were so hungry for such views. I looked around wildly in order to not miss any of the beauty: the hills, sandy and rocky mountains, green fields, huge trees, and colorful flowers. On our way from Erez to Jerusalem, as I pondered nature, I sang Fairoz’s song about the streets of the old Quds, feeling so happy that I had made it, in spite of every difficulty I had passed through. The taxi driver, who is originally from Jerusalem, noticed my painting book and asked me about it. “I am an artist and I always wanted to draw the dome of Al-Aqsa mosque face to face one day. So I hope that this will be my chance to do so,” I said. “Do not be so dreamy. I have to drop you by the American embassy, and immediately after you all finish your visa interviews, I will take you back to the Erez border,” he replied. After I thought everything was going to be fine, I was mistaken again. I don’t blame him, as he just followed the orders issued by the embassy. I pity the situation though, living as a stranger in my homeland. As soon as I got out the bus and stepped onto the ground, I started jumping, feeling happy that I was standing on the Holy Land. Everything was perfect with the visa interview and thankfully I got it. I did not want to go outside the embassy as we would then get picked up to go back. Eventually, we had to ride the bus and I was lucky enough to take two beautiful red flowers with me. They were so strict about taking us directly to Erez, but the driver sympathized with us and could understand what if felt like for Gazans who are in Jerusalem, for the first time in their lives, to reach it without seeing the Dome of The Rock and the Al-Aqsa mosque. In the end, he said that he could only take a street which would allow us to see the view. I saw it from so far away just like it is seen in the picture, such an amazingly beautiful scene that my eyes could not stop gazing. It is like magic. Seeing that view, and the fact that we could not go closer, and even that we couldn’t open the window and put our heads out, made me very emotional. “I have to move. I am sorry,” the driver said with a broken voice. I turned my head toward the dome until it disappeared into the distance, leaving behind a long silence. I went to an empty seat in the back of the bus and lay on it, closing my eyes and letting my soul fly over Jerusalem’s dome. With a mixture of feelings, I fell asleep. I woke up when I arrived at Erez, and now write to you about my trip to Jerusalem from my own room in Gaza. This entry was posted on May 24, 2011 by Shahd Abusalama. It was filed under Reflections and memories and was tagged with America, American Ebmassy, Erez border, Gaza, Gaza siege, Israel, MEPI, USA. Shahad, great story, unfortunately, it does reflect the ugly reality. Please publish this everywhere. This is our true weapon that can help us to freedom.Our fake leaders only taught us how to fight a losing battle and they are our misery as well as the occupation.we really have no idea how powerful this article, and we also have no idea the size of the indirect forces of the occupation who try to silence us. Thank you for sharing these experiences; you are also a very talented writer as well as an artist, and our soul aches alongside yours reading your words…I will share it around and hope you are able to share this as much as possible. Shahd, i'll be repetitive: thanks for sharing your experience, your kind of writing directly create in my head situations, feelings. Wish those kind of discrimination can change. I'm italian living in Spain, i'm an artist too… Maybe not that good and more commercial as i'm a designer, but i love writing too. Hope to read you again. they aimed at you for a reason; they know a lot about you than you think Shahed they purposely took you to an empty room , you think its empty, but its not its full of cameras..They know you have a blog and they know about your drawings and about your friendship with Vittorio and other activists so to them you are a threat…all i have to say is i went through airz too and they didn't do that to me cause i am not much of a supporter for the Palestinian case ..i am a normal person that doesn't belong to any party at all. Also, they know the history of your dad and that he was imprison in Israel .. just be careful hun they may use your pictures against you someday so be extra careful not trying to frighten you but you shouldn't have listened to her .. cause the first machine that you went through shows everything you have or keep and also you shouldn't have shown you excitement at all cause they are video cameras everywhere; and they are bunch of psychological analysts that can analyse your personality … and that's why i hate traveling from airs cause its dangerous …. Am Proud of You!!!! As I read tears come down and I pray that One day this will End..I know one day it will insha'allah, I admire your courage and I am speechless for the way your write and because through it I can feel and I can picture how the situation its in Gaza and whole Palestine.. I want to tell you that I share some of your articles for a page I have in which we support Palestine, I share for people to see and know what is the reality of Palestine and its People.. May Allah reward you and May Allah reward all My Palestinians People who struggle daily..
Our prayers are with you. You are a good writer. Thank you for relating your personal experience. Keep writing, the world will know.